Ready to use 3-in-1 defender technology to control bugs, powdery mildew and provide roses with nutrition. Child, pet and bee safe, ecofective Rose Defender is a ready to use pesticide free spray which protects roses from bugs and powdery mildew while also nourishing the plant too. For use outside and undercover, ecofective Rose Defender controls a wide range of pest species including whitefly, aphid, red spider mite, mealybug, scale and psyllid. This not only makes them safe to be used around children and pets, but also safe for bees and wildlife too. 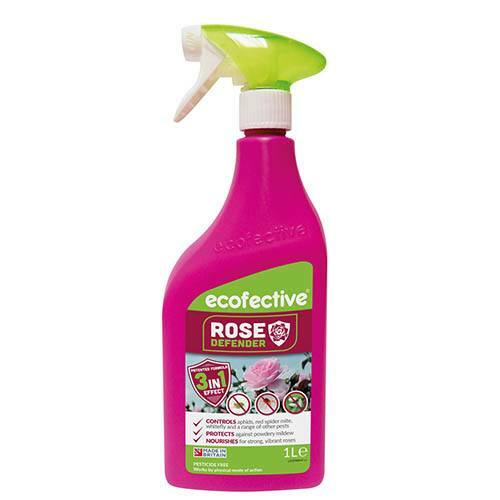 ecofective Rose Defender also helps to control, with regular use, powdery mildew by physically washing the foliage to remove active mildew spores. The formula can be used on roses, plus other flowers, shrubs and vegetables, providing foliar nourishment to encourage healthy plant growth and promote vibrant flowers, as well as abundant fruit and vegetables. There is no harvest interval required, meaning the produce can be eaten within hours after application. Supplied as a 1L, ready to use spray bottle.